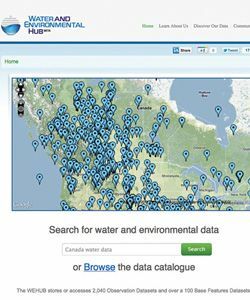 Democratizing Data: WEHUB harnesses the web to provide Alberta with a powerful, public water database. When then-Minister of Environment Jim Prentice announced the federal government’s desire to keep more accurate and up-to-date information around water and water data in 2010, the University of Lethbridge jumped at the opportunity to get involved. The result is an open-source web platform called the Water and Environmental Hub, or WEHUB for short. The WEHUB website will offer searchable, customizable data interpretation through its application programming interface (API), which will allow users and organizations to build applications for managing the data to suit their needs, with the potential to share those applications and findings with other users. Cybera is a not-for-profit organization that works to facilitate technological innovation in the province of Alberta through the use of cyber infrastructure. At the end of March 2012, WEHUB itself will officially become a not-for-profit. This goal of total collaboration is a couple of years away as software must be upgraded across various organizations and as phase one of WEHUB’s development is completed in 2012. Phase two is still in need of funding, but Joseph is confident that existing leads will be confirmed by the end of 2011. Joseph estimates that there are thousands of custom applications possible. “We’re making the data available through API, making it easy for smartphone and web developers to build these apps and even embed the data in their sites,” he says. For example, a watershed organization might produce a yearly report, collecting data from various sources throughout the year. By the time that report is released, most of the data will already be outdated. A custom application would allow the organization to connect and interact with other groups, live data sources, policy makers and community members in real time, spending less time and energy on research while providing current, relevant information in its reports. “There have already been projects identified to enable better water management and watershed planning,” says Joseph.